Check out the Baci Outlet + $100 Giftcard Giveaway! 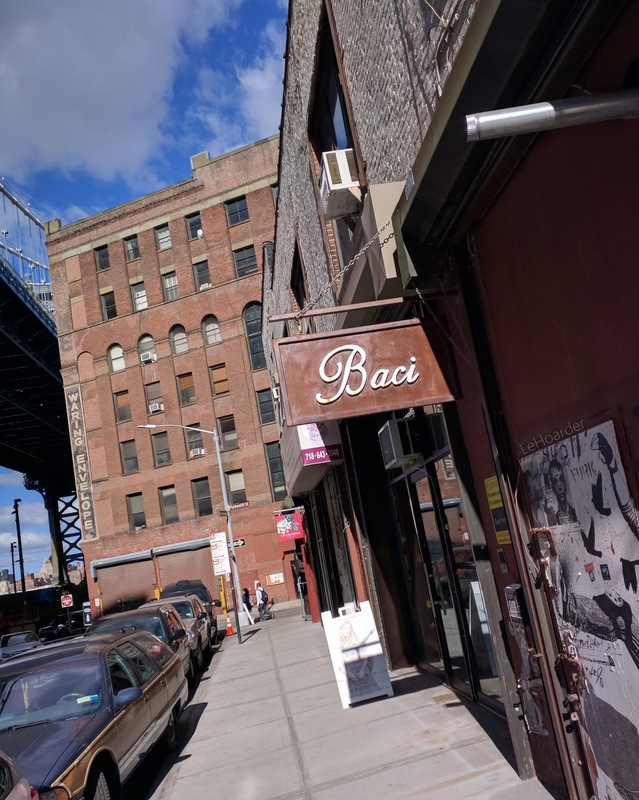 In Brooklyn, tucked under the bridge is a little known secret called Baci Outlet where everything is priced $50 or less! It's like a year round sample sale always stocked full of goodies. Baci is an affordable Italian fashion brand with lots of cozy knits and soft colors. They restock every few weeks so you never know what you're gonna find. Even more exciting, I'm partnering with Baci Outlet for a $100 giftcard giveaway on Instagram! All you have to do is follow us, like the photo and tag a couple friends. Easy peasy! Head to my Insta for more details! Their styles have a very relaxed vibe - lots of comfortable fabrics! And how cute is their festive display? More coats - so much texture! 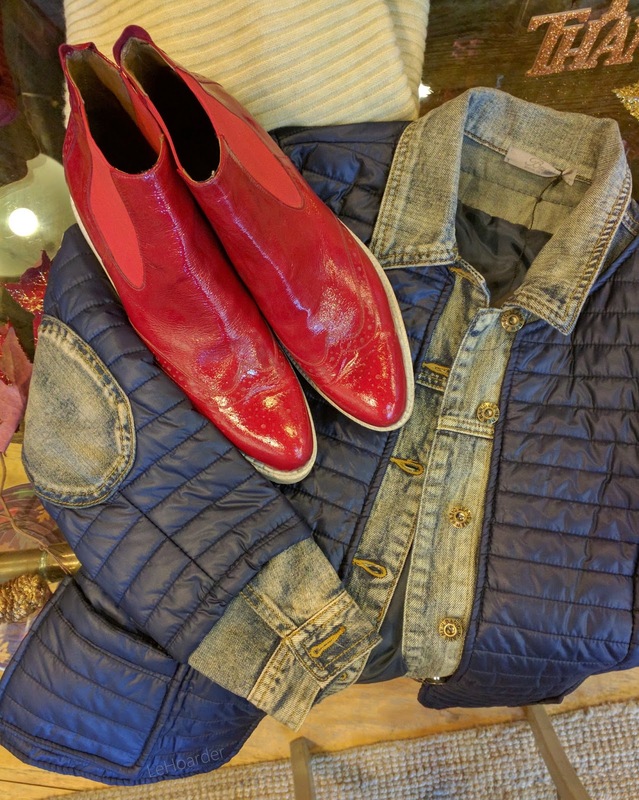 In the end I choose these adorable red booties and the coat in navy! I strongly recommend heading to Baci to see what you can score! With code LeHoarder10 you get 10% off your purchase now thru 12/31. Be sure to tell them I sent you! 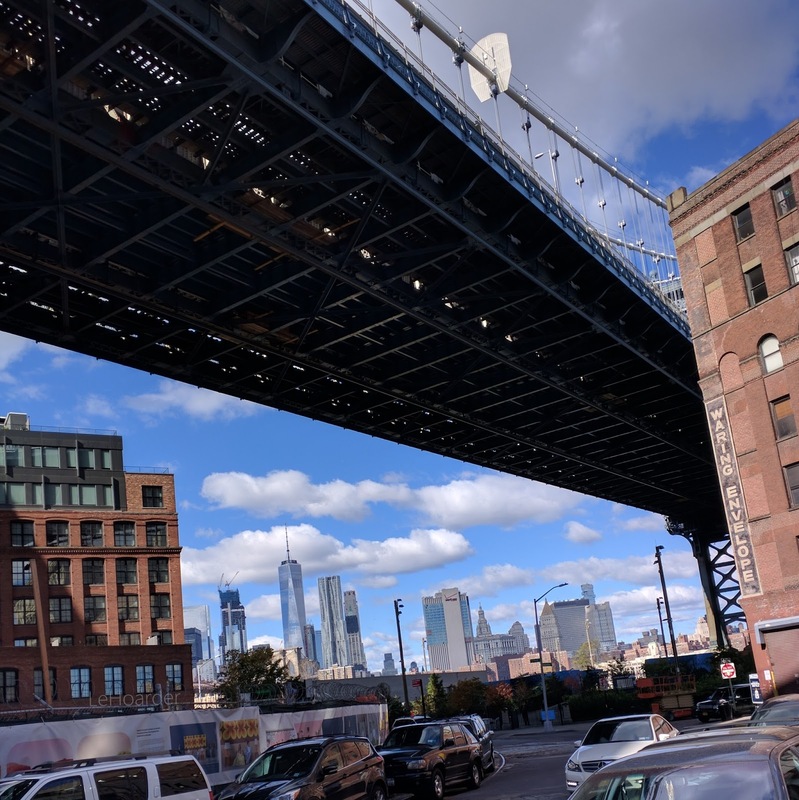 I realized I do not spend enough time in DUMBO. They are so many Instagram-able walls and gorgeous views that you better believe I'll be back there soon! Me and my Baci swag! This was the first time I wore my Valentino Rockrunners that I scored for $99 at TJ Maxx last yellow sticker markdown. They are actually insanely comfortable - I can't believe I didn't pull them out sooner. I can't even begin to tell you how good things have been in sample sale land. Be sure you are following my Insta stories to see my daily adventures and deals! I have a family affair this weekend and my parents are visiting from out of the country so it's insanity over here. I'll have to have an epic haul post soon. I keep thinking about heading to YouTube to reveal my hauls - what are your thoughts? Other than popping into Baci check out Racked's listings for all the NYC sample sales right now. This week I went to A.V. Max, Carolina Amato and Alice + Olivia 2x LOL. All the deets are listed in a previous post here. I also started uploading some of the pics to my Facebook page, ShoppinggalNYC in case you miss my Insta stories. 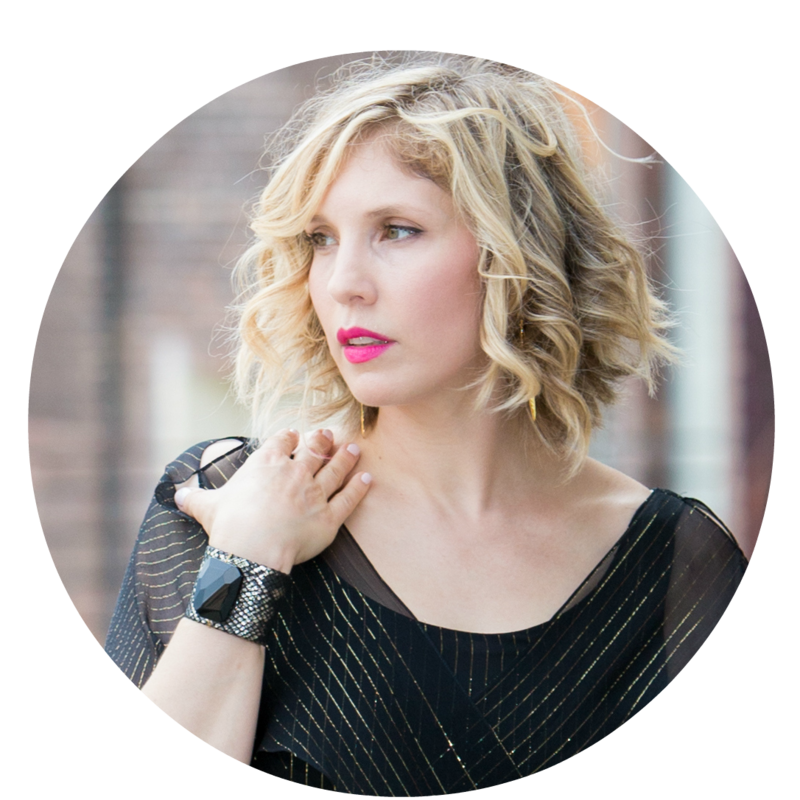 Thank you to Baci Outlet for sponsoring this post and giveaway! Check out their Instagram and Facebook pages for their latest deals and updates. Good luck to everyone entering! Awwwww nice surprise to catch me here. Thanksssss girl. <3 They look like they have some great outerwear and those booties are so fun! I really need to hang out around DUMBO more often! What a great giveaway! I love those red boots. shopping events are so fun! and what a cool giveaway! I totally agree! Thanks so much! You totally should - it's a hidden gem! Baci sounds like a cool brand. :) I know Italian brands make like the most best leather clothing pieces and it's so nice that you're hosting a giveaway for us. I'll be sure to check it out. They do - so luxe! Baci uses such beautiful fabrics. Thanks for your support! Thanks - so obsessed with wings! And OMG it totally is! I always see these wings photos pop up on Instagram. Man, there must be so many amazing places in NY to shoot. I would have to stay such a long time to feel I made the most of it! LOL - there are. I'm still discovering them. I really need to take advantage of all the amazing backdrops. what a great giveaway babe, thanks for sharing this! looks so amazing! Sounds amazing! I loove finding out for stores like these. You got some amazing stuff for you! You're looking gorgeous and totally digging those cool kicks! I wish I could be there to browse too! I'm going to be traveling to NYC soon so I will make sure to head to the Baci Outlet!! Love the unique and extraordinarily affordable selection! I especially love the way you styled it all !! Oooh if you're gonna be here before the end of the year you should totally enter! Right?! That's my fave thing about NYC! It's not that big but it has a really nice collection. The coats were totally worth checking out! Never heard of this store before. They have some really trendy pieces in there. I need to go next time I visit NYC! I love to search in the outlet and more on the vintage markets. I've been seeing that angel wing shot all over instagram! You look amazing babe! LOL - it's such a good background - I need to find more wings!!! I can tell you're a pro at finding fashion bargains and I wish I could visit Baci but I live too far away. I adore the red booties that you scored and can't wait to see you rocking them gorgeous! Omg that pair of Valentino sneaker is such a good bargain! I love all those outlets in the States! Wish I'm living there and everything will be arm length. So Jelly, girl! LOL thanks - you really find the best deals here in the US. My sis lives out of the country and she's always shipping things to my house for me to send her. $50 sounds freaking amazing! I love how you're always style hunting for less. I mean, let's face it. How many of us can really afford buying expensive clothes all the time! Love that long bomber jacket actually! It's so unique! Thanks Maggie! I'm a shopaholic so the only way I can shop and not go broke is to do it on the cheap. This is awesome girl! Great photos and I really like that bomber jacket! This store seems like such a find! Love the jacket you ended up picking up. It really is - thanks Tania! I bet you can find a lot of great deals there! And I love those photos you took in front of that wings murales! Thanks - they did have some great pieces. And yes - totally obsessed with the wings! This is awesome! I've never heard about this before but definitely need to check it out next time I'm in NY. Love finding spots like this! Everything looks awesome! Right? So exciting when you find that hidden gem! omg i wish we had outlets and sample sales that had such great prices, seriously!! You always find THE BEST deals on everything. You're a true bargain queen! I love me a great sample sale. Such great finds at such great prices. I especially love all the shoes you shared ! Me too - thanks so much! Are you saying those coats you got were $50 each? That is unbelievable. I have to check out Baci when I visit NY, such a great store. Love yall's outfits too! Yep - everything is $5o or less - such great deals! Short and Sweet - and a Giveaway!